Note: Broke maiden in his fourth attempt at Monmouth Park, and then shipped south to win the Jean Lafitte at Delta Downs. He faded to ninth in the Delta Jackpot (G3) to close out his juvenile campaign. At 3, he finished third in the Holy Bull (G3) at Gulfstream, and then second in the Gotham (G3) at Aqueduct. 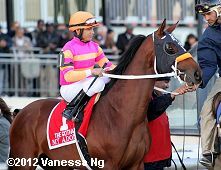 Ran poorly to finish 9 1/2 lengths behind in 7th (last) in the Wood Memorial (G1) at Aqueduct. Skipped the Derby and instead ran in the Canonero II Stakes at Pimlico where he finished 3rd.